Next week something magical is happening. Seattle is getting a Vintage Computer Festival. It’s the Vintage Computer Festival Pacific Northwest, and it’s happening Saturday, February 10th and Sunday, February 11th at the Living Computers Museum and Labs. As with all Vintage Computer Festivals, this is one with plenty of exhibits, speakers, and the ever-popular consignment shop. A few of the more interesting exhibits include a demonstration of the Syntauri alphaSyntauri, a synthesizer card and controller designed for the Apple II. When it was released in 1980, this was the first affordable digital synthesizer that competed against the Synclavier and Fairlight CMI. The difference? Synclaviers cost as much as a house, where the alphaSyntauri cost as much as a car. Also on deck is the dis-integrated MOnSter6502, a complete NMOS 6502 constructed out of individual, surface mount transistors. The Digi-Comp II from Evil Mad Scientist will be there, there will be BlinkenBones, and for anyone who wants to assemble their own front panel for a vintage minicomputer, [Oscar Vermeulen] will be there with the Pi-DP/8. This isn’t an event to miss. As an aside, we’d really like to commend the Vintage Computer Federation for their incredible work in putting these shows together. The VCF West at the Computer History Museum in Mountain View is an incredible show, VCF Southeast has some amazing displays, and VCF East in New Jersey is a pretty incredible gathering going down May 18th through the 20th this year. The people working behind the scenes to make these shows happen are doing a service for all vintage computers and performing digital archeology that benefits us all. 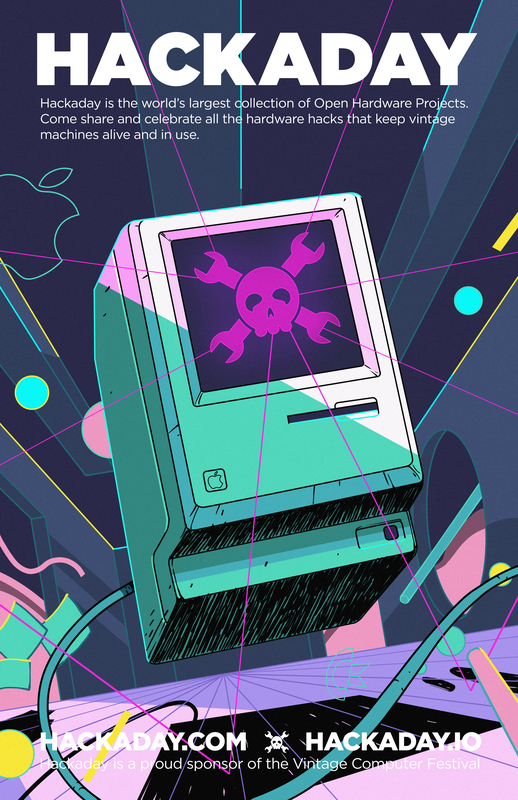 Hackaday is proud to be a sponsor of VCF Pacific Northwest. Been lookin’ for a new home for my Compaq “Lugable” CPM OS antique..
Maybe next year I’ll drive North a bit..
We’re going to have a consignment area. Drop it off on Friday night .. if it sells, we take a small cut. If not, you take it back home on Sunday. Consignment is a great way to buy or sell. I’m going to try to find time to do both while the show is going on. Closest we have right now is VCF West every summer in Mountain View. Oh wow. VCF East is in May? I can’t wait. Is any of the HAD staff going? Yum… old computers! Brian if I know what kind of ‘brownies’ you like, I’d bring some.. never mind, I’ve figured it out! It is probably best they keep these types of events as far away from Phoenix, AZ as possible. Given my existing collection of retro-junk and my shopping list of things I am looking for… this event would likely bankrupt me.